Quilts have traditionally allowed American women to express themselves through needlework and pattern. 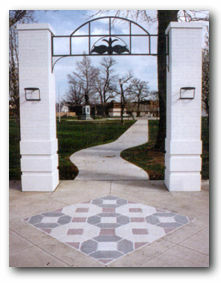 The Quilt Walk is a tribute to those creations. Public art makes Great Bend's city landscape interesting. You don't have to visit a museum to find art in Great Bend. Murals are painted on building throughout the city. Painted by high school students, community volunteers, senior citizens, professional artists, and children, the murals have themes relating to great Bend's past and present. Self-guided tours and maps of the Quilt Walk and Murals are available at the CVB and inside the Barton County courthouse.